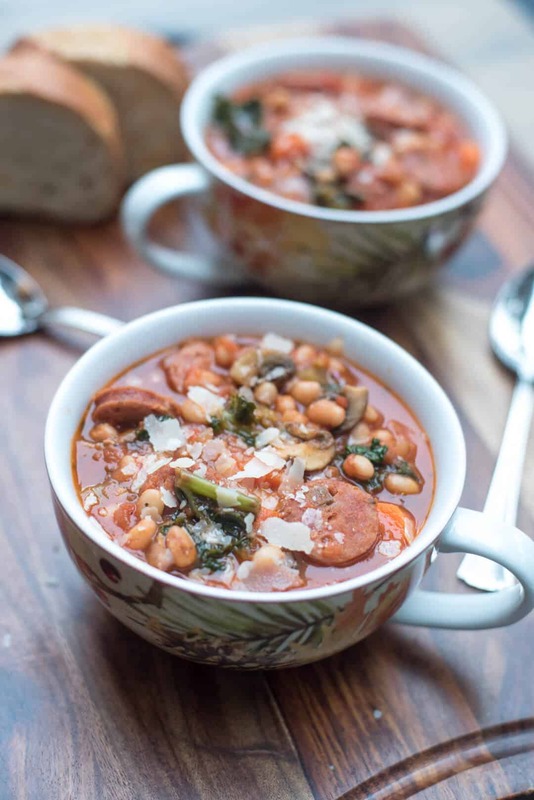 This rustic, comforting Sausage White Bean and Kale Stew is just the thing you need to warm you up on a chilly day. 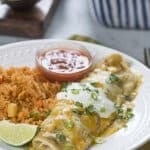 A wonderfully easy, delicious, and satisfying fall meal. Hi guys. Is it getting chilly in your neck of the woods yet? We are blessed with our usual gorgeous fall weather here in Northern California. With the sun a bit lower in the sky, our sunny days are just spectacular. The leaves have turned every possible shade of red, yellow, and orange and the sun is casting a beautiful glow over it all. It’s a glorious and beautiful time of year here. 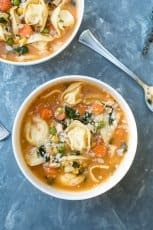 The happenings outside have completely shifted me into my fall eating patterns which means lots of hearty fare and definitely soups and stews. 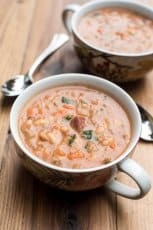 Did you catch my Roasted Cauliflower and Corn Chowder? 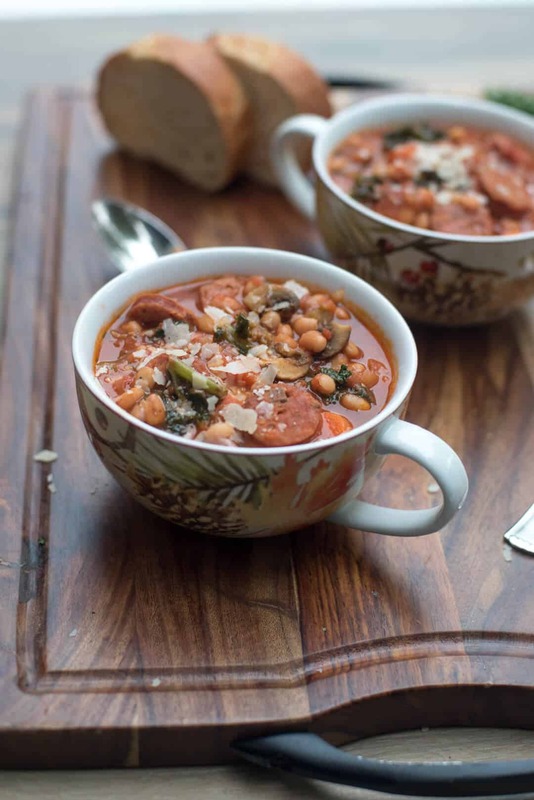 That was my first burst of fall cooking and I’m back today with this pretty pot full of Sausage White Bean and Kale Stew. 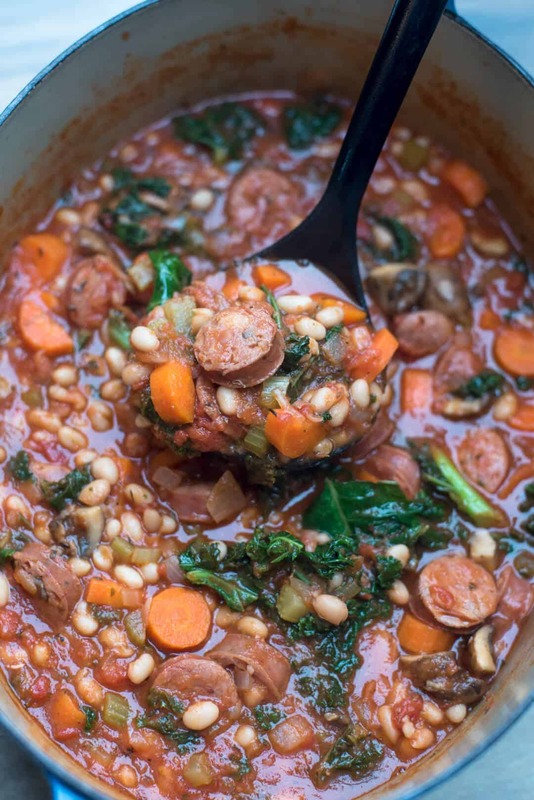 This recipe was inspired by my Skillet Sausage and White Beans with Spinach from the archives – a delicious 30-minute meal I make frequently through the fall and winter months. 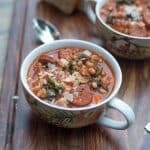 I added some additional veggies, subbed kale for the spinach and gave the whole thing a more substantial, stew-like consistency. 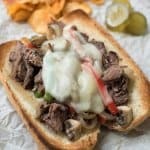 You will definitely want to serve this with some sliced French bread for dipping and, if you are so inclined, a nice glass of red. I am definitely inclined. 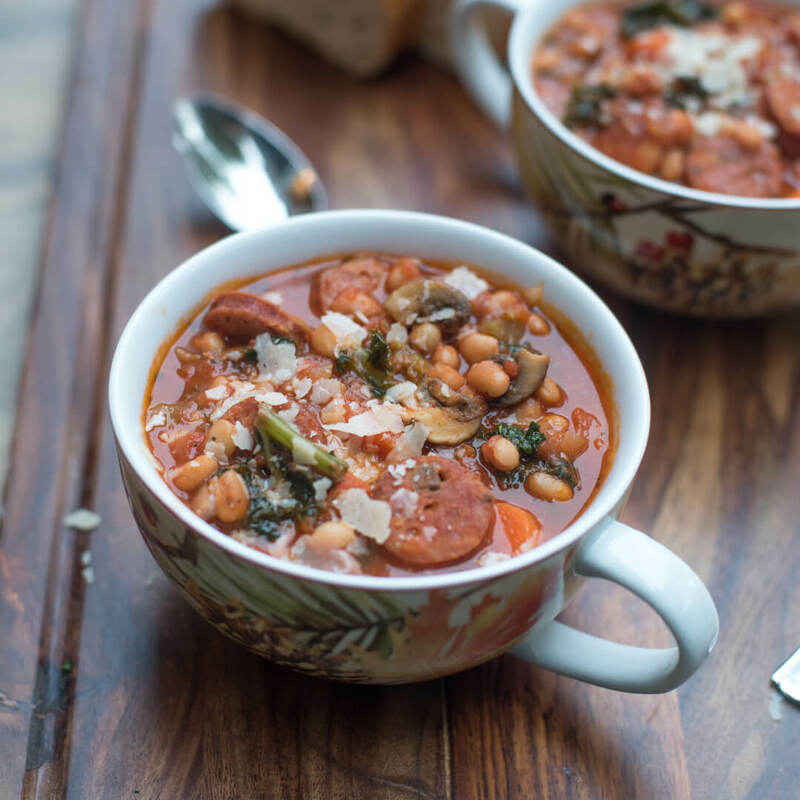 Start by browning sliced sausage in a couple of tablespoons of olive oil in a soup pot or Dutch oven. 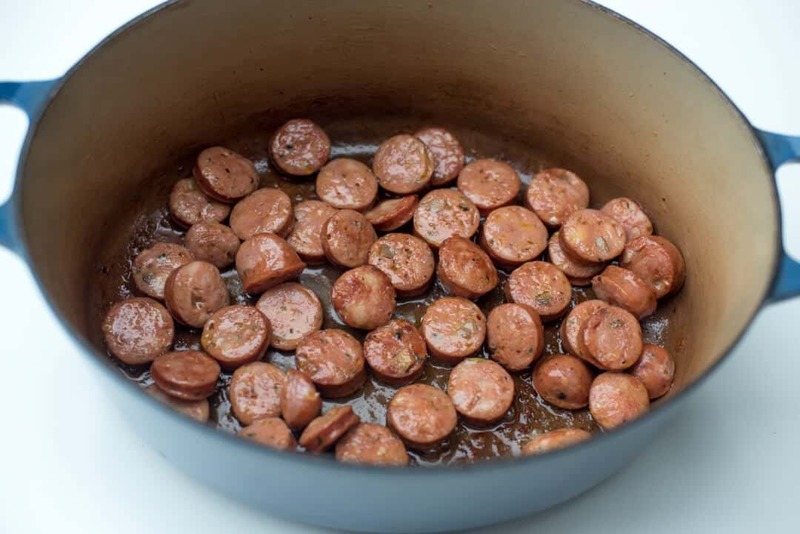 Any type of sausage you love will work great in this recipe, as long as it is the fully-cooked variety. 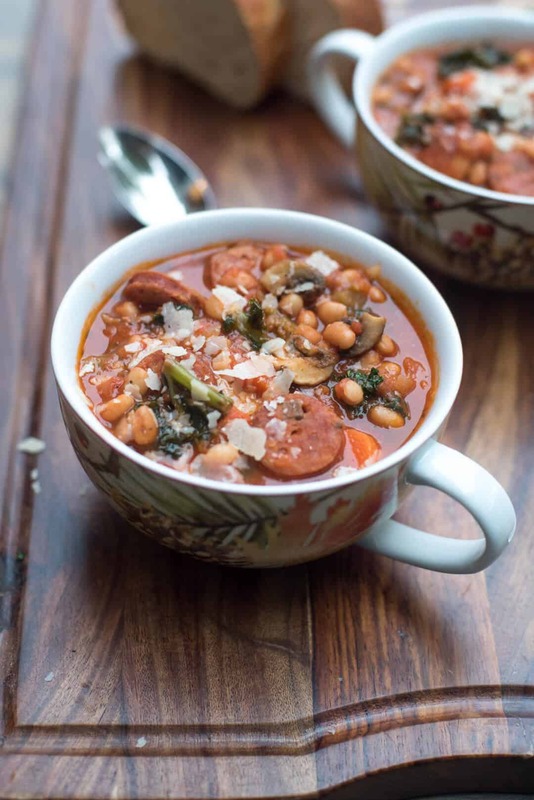 I almost always have Aidells Chicken Sausage in my freezer so that’s what I’m using here but this would be fabulous with smoked sausage or it you like things spicy, andouille would be delicious. One it is nicely browned transfer the sausage to a plate and keep warm. If needed, add a little more olive oil to the pot and then in go the veggies. Diced onion, celery, roughly chopped carrot, quartered brown button mushrooms, and garlic. Cook and stir the veggies until they have softened slightly. Time for the kale. 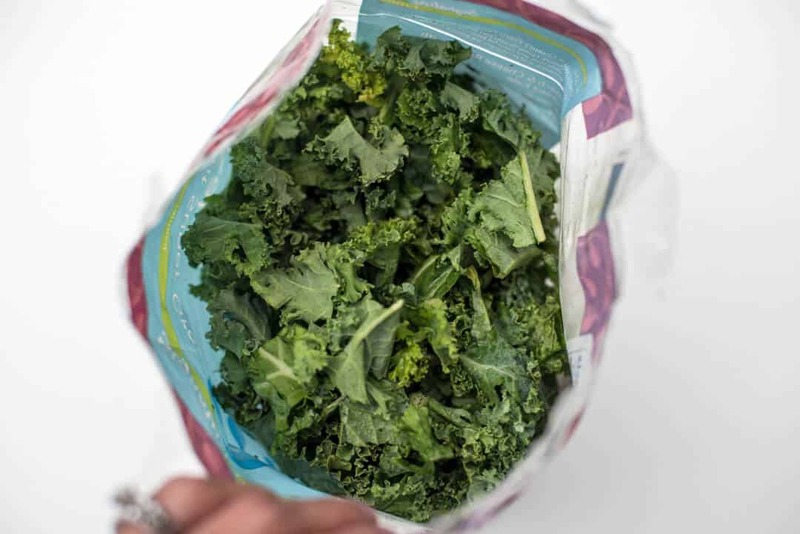 Check your produce section for the bagged, chopped variety to make your life easier. Otherwise, one small bunch roughly chopped should do. 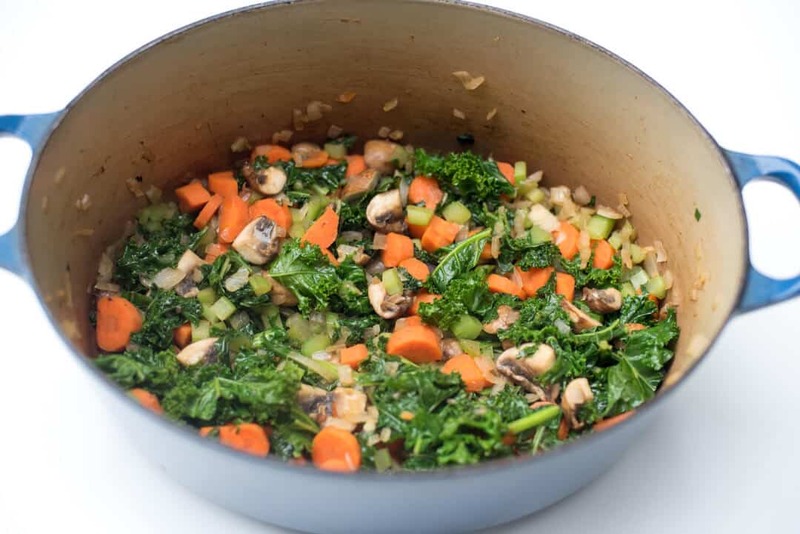 Add 4 packed cups of chopped kale to the pot with the veggies and cook just long enough for it to wilt. 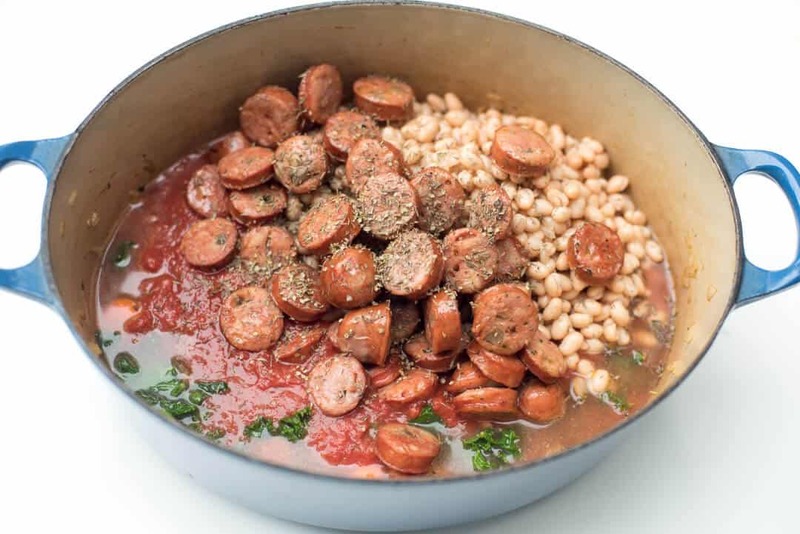 Add some low-sodium chicken broth, a can of crushed Italian-style tomatoes, 2 cans of small white beans (rinsed and drained), the browned sausage, a little dried thyme, marjoram, salt and pepper. Cover and simmer the stew for 20 to 30 minutes until the veggies have softened to your liking. 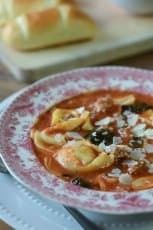 Garnish the stew with a little Parmesan and serve with French bread. It would also be absolutely delicious served with a warm slice of my Rustic Sweet Cornbread slathered with a little butter. 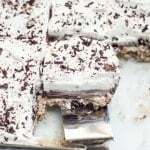 I think that is going to have to happen in my kitchen soon! Heat oil in a large pot or Dutch oven over MEDIUM heat. Add sausage to pan and saute for 5 to 6 minutes or until sausage is nicely browned. Remove sausage to a plate and keep warm. Add additional olive oil to pot, if necessary. 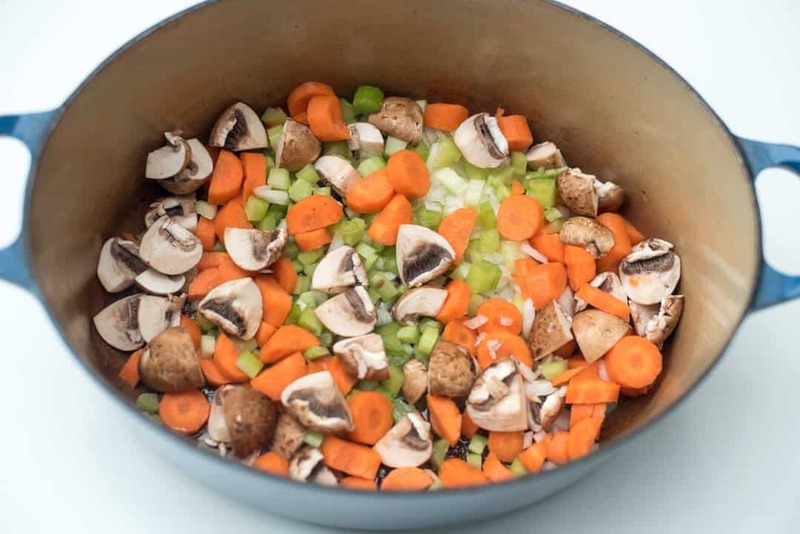 Add onion, carrots, mushrooms, and celery into the Dutch oven. Cook, stirring, for several minutes until veggies have softened slightly. Add the kale and cook, stirring for just a minute or two to wilt the kale. Add the crushed tomatoes, chicken broth, white beans, thyme, marjoram, salt and pepper. Add sausage back to the pot. Stir to combine all the ingredients. Increase heat under pot and bring mixture to a boil. 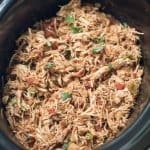 Cover, reduce heat to LOW and simmer for about 20 to 30 minutes. 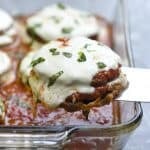 Serve garnished with Parmesan cheese. 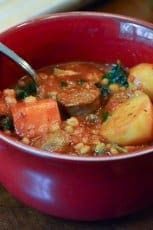 This stew is Delicious!! It is my new favorite meal. I used spicy sausage. I love all the different textures. 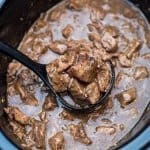 Really good, hearty stew. I used spicy sausage, as well. Hubby loved It! Thanks for sharing!